GasMart is planning to develop a new location in the heart of Webster Groves. On Nov. 19 the Webster Groves City Council voted unanimously to approve a proposal for a GasMart. Over 35 students and residents attended during the final vote. All six council members, along with Mayor Gerry Welch, voted yes for the GasMart gas station development. Jim Wiedemeier of Wiedemeier Architects represented GasMart during the Nov. 5. City Council meeting and proposed the vacant property at 7996 Big Bend Blvd. be used to build a GasMart gas station and convenience store. 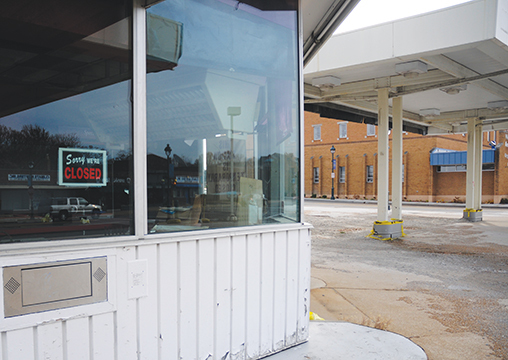 GasMart plans to invest about $2 million into the vacant location. The property is currently owned by Bucks Inc., a gasoline and oil company. It had served as a gas station for more than 40 years until 1994. On Nov. 19 the Webster Groves City Council voted unanimously to approve a GasMart to be opened at Murdoch and Big Bend. Director of Planning and Development Mara Perry said the new development should not substantially increase traffic hazards or congestion, fire hazards, adversely affect the general welfare of the community or overtax public utilities. During the City Council meeting, the proposal raised concerns among residents and local businesses. Some residents were concerned the GasMart establishment would cause problems, mainly traffic congestion and accidents. There are currently three entrances to the property — two come off of Big Bend Boulevard and one off of Murdoch Avenue. Because the entrance on Murdoch Avenue, in particular, raised concerns about accidents and congestion, it was suggested the entrance be closed. Perry said the City of Webster Groves contacted St. Louis County for another perspective on the entrance. St. Louis County also recommended the entrance to the location be closed. According to police records, eight accidents have occurred at the intersection in the past five years. Local businessman Joe Fichter of Subaru-Isuzu-Suzuki said he feared the addition of a gas station at the location would increase the likelihood of accidents. He said he was concerned for the safety of pedestrians who walk up and down Big Bend Boulevard. Other Webster Groves residents at the council meeting shared Fichter’s concern. Other residents expressed concern for the attention the station would bring if established. The proposed hours of operation are Monday-Thursday from 5 a.m. – 11 p.m. and Friday-Saturday 5 a.m. – 1:30 a.m.
Senior film production major Lacey Turner agreed opening the station could effect the Webster Groves community negatively. “I think it’s a bad idea, because it allows students to buy alcohol, which could lead to car crashes,” Turner said. The government came to a decision and reopened today, Oct. 17.